Los bros Guigar, in a pre-trick-or-treat photo session at Grandma’s house. Notice the 11yo’s Method-Acting aherence to the “no-arms-for-Creepers” aspect of his character. Since the in-laws moved to Manayunk, I’ve kinda fallen in love with its Main Street district. With cool bars like Kildare’s Irish Pub and awesome eateries like Han Dynasty, Laxmi’s Indian Grille and (who am I kidding) Whirled Peace… there’s always a reason to walk to Main Street. So when my in-laws invited us to bring the kids down to Halloween in Manayunk, I jumped at the chance. The kids got a ton of early Halloween candy, and I got a trip to Kildares. That’s called a win-win, if you’re scoring at home. 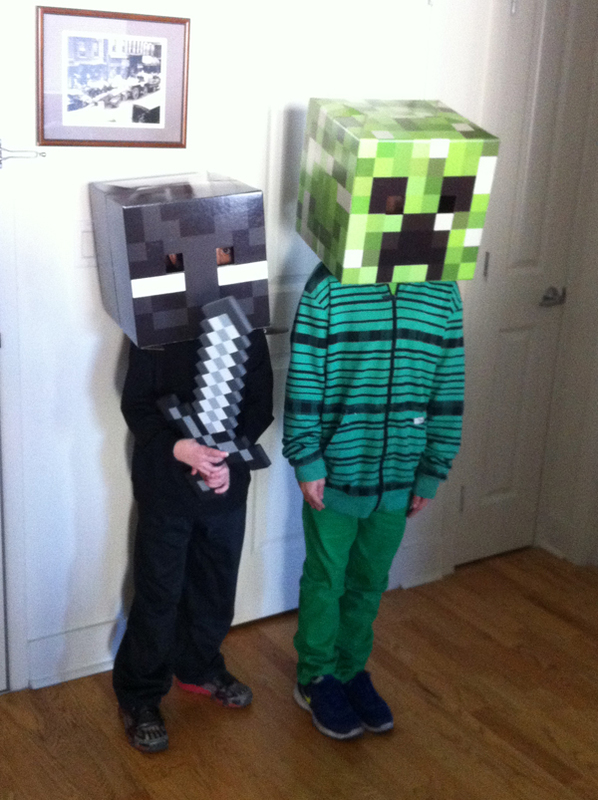 Plus, the boys got their first taste of cosplay glory, as they were repeatedly complimented and stopped for photos in their Minecraft gear. A bunch of the downtown merchants were offering candy to kids who stopped in, and although I was too distracted by the festivities, there was a nice-sized flea market going on towards the end of the street. We missed the Zombie Thriller Dance-Off in favor of a much needed lunch. Then it was back to the in-laws’ apartment for a movie marathon (while my wife had a well-deserved Moms’ Night Out to see “Emma” at the Lantern Theater). She says you should go. It was very good, and they’re holding it over for another week. “It Came From Outer Space” delivered everything it promised: Campy 50s sci-fi thrills, movie-with-a-message chills… and the Professor from Gilligan’s Island(!) This was based on a Ray Bradbury story. When it was optioned by Universal, the studio wanted the aliens to be portrayed as malicious, but Bradbury wanted them to be benign. He offered to write to version and let the studio pick — with the caveat that if Universal picked the “benign” version, Bradbury would stay on to write the screenplay (his first attempt at writing for a movie). Unfortunately, the studio took the treatment and hired Harry Essex to do the final screenplay. “Isle of Death,” on the other hand, promised vampires, but instead delivered a steely performance by a curly-haired(!) Boris Karloff and a psychological thriller/suspense drama. It examines the conflict between religion and science in the context of a group of strangers under an unplanned quarantine caused by a plague outbreak. But no bloodsuckers. Oh, sure, there was a woman buried before she was quite dead, and a mass of murders and painful deaths, but it certainly wasn’t the kind of horror flick we’d anticipated. Nonetheless, you get to see Karloff flex his formidable acting muscles. And perhaps better yet, it offers a vibrant, young Alan Napier (who you know better as Alfred the butler in the 60s Batman TV series).